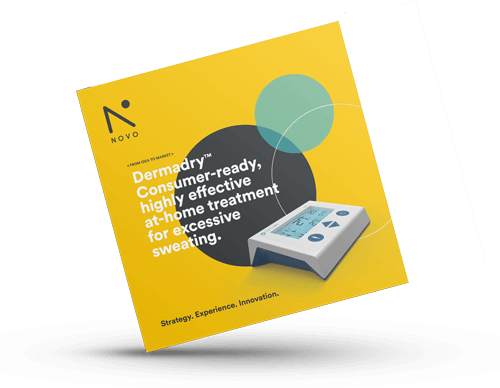 Using iontophoresis to treat hyperhydrosis (excessive sweating) was known to be effective, but no certified, user-friendly, affordable product was available on the market. We provided the user experience design and engineering expertise that the Dermadry entrepreneurs needed to transform their rough prototype and reassure investors. Dermadry initially asked for help redesigning their product interface and receiving certification. Using our experience with medical devices, usability, and design, our team demonstrated that the entire apparatus needed to be redesigned to help Dermadry reach its goal of successfully launching this device on the consumer market. Multiple criteria had to be met at the same time, including user comfort, usability, and affordability. The device had to provide maximum comfort since the technology directs a small current through the user’s skin. As with all projects, we used a collaborative approach. Our teams worked together to take advantage of the extensive market and end-user knowledge provided by Dermadry. Their founder personally tested the design and gave feedback to evaluate the device as a user. He worked with our teams to ensure that the current was effective but not unpleasant. Since the device was for home use, the interface needed to be highly intuitive and easy to use. As well, the device also had to be affordable, sleek, and consumer friendly. Our engineering and design teams worked closely together to incorporate the patent-pending technology into a highly intuitive, non-invasive medical device. Safety and user comfort were primary concerns, requiring much analysis from both engineering and design, along with user feedback. Our engineering and software development teams worked in tandem to develop the firmware and hardware required to make the device work as envisioned in the design phase. By taking advantage of our project management, engineering, design, and quality systems expertise, Dermadry had a more polished prototype in five months to show financiers and secure funding. In addition to developing the prototype, our team also provided the supporting documentation required for certification. The redesigned Dermadry product passed the first trial to receive Health Canada approval. The Dermadry team is pursuing additional certifications so that the device can be sold in worldwide markets.